Every once in awhile, the stars align…the elements find their place…and a creative team comes along that not only defines the material for a generation, it exceeds all expectations to the point that those very expectations fade into oblivion. Headed by the producing duo of Bruce Timm and Eric Radomski following their success with “Tiny Toon Adventures,” 1992’s “Batman: The Animated Series” set a standard of animation and storytelling excellence that as far as I’m concerned has yet to be (and most likely never will be) matched by any other animated program of the day or in the foreseeable future. With its design aesthetic, its tone, its atmosphere and its wit, it continues to be regarded by Batman fans at large as the single best translation of the character to the screen…big or small (that includes Nolan’s efforts). Primed by the success of Tim Burton’s original films, the series was given a great starting-off point of interest…however, the show quickly gained popularity on its own steam through various techniques of storytelling, craftsmanship, characterization and action. Following through from the film, the series begins with an established Batman (voiced by Julliard grad Kevin Conroy), an urban myth/vigilante hero lashing out from the shadows to clean up the crime-infested streets of Gotham City. Save for honest Police Commissioner James Gordon (Bob Hastings) and faithful butler Alfred Pennyworth (Efrem Zimbalist Jr.), the caped crusader’s allies are few and far between as the police and society in general regard him as a creature that either doesn’t exist or needs to be avoided. Operating outside lawful jurisdiction, Batman wages an ongoing conflict against crazed criminals such as Wormwood the Interrogator and Roland Daggett, mob tycoons Rupert Thorne and Arnold Stromwell, monsters and abominations like H.A.R.D.A.C. and Anthony Romulus…not to mention his notorious gallery of arch villains such as the Joker (Mark Hamill), Clayface (Ron Perlman), The Riddler (John Glover), The Mad Hatter (Roddy McDowall) and countless others. What really sets “Batman: The Animated Series” apart both from other incarnations of Batman and other animated television is the mere fact that the producers, directors and writers took the material far more seriously then you’d think a cartoon version of Batman ever could be. So much so that to call the show a “cartoon” would be a disservice. No…this is an action/adventure drama…with real and emotionally developed characters that just so happens to be animated. Here, Batman and his universe aren’t figures of whimsy or childish nonsense. While there are streaks of fantasy sewn in (it still is Batman after all), the material is handled in a very adult-conscious manner…which easily allows both kids and adults to enjoy the series quite easily. A prominent example of this handling resides in the episode “It’s Never Too Late,” which involves a mob war between rival gang bosses Rupert Thorne and Arnold Stromwell. In one scene following a daring rescue, Batman brings Stromwell to the Sunrise Foundation…an inner city drug rehabilitation facility. There he shows Stromwell the spoils of his business in dealing and manufacturing narcotics; Stromwell’s own son Joey resides there…bed ridden from withdrawal. Another more obvious example of the material being adult? In a period where action-oriented cartoons like “G.I. Joe” had had bad guys wielding lasers and ray guns, “Batman: The Animated Series” was the very first animated television show that equipped its villains with live munitions. Yep…the show was of such high quality that the rogues actually got to use bullets, which had been unheard of prior. Throughout the series, episodes actually took the time to analyze Bruce’s inner turmoil. 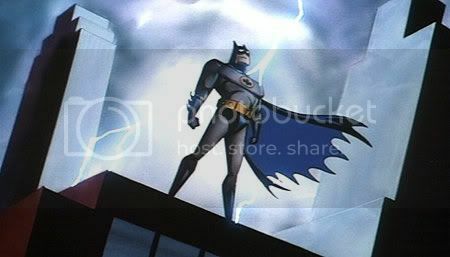 For example, the episode “I Am the Night” found Bruce in conflict with his crusade when a botched sting operation leads to Commissioner Gordon being shot in the line of duty. In a wonderfully poignant scene, Batman returns to the Batcave following a visit to Jim in the Hospital. Overcome with grief over his own involvement in the falling of his ally, Bruce tears the Cave apart in frustration…screaming in agonized rage. Following the example of Burton’s films, the series also chose to set itself in a timeless age. There’s no discernible way to determine exactly when or where this tale is being told. This is achieved through the show’s beautifully atmospheric Art Deco design and overall artistic aesthetic. 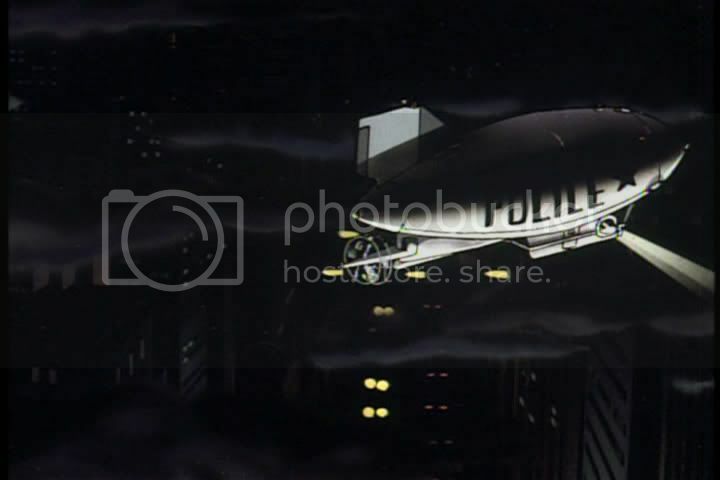 Somehow placing Batman in a world of 1930s cars, black and white television sets, Police Blimps and Film Noir just clicks with the character. It’s not really a period piece mind you…but the show is just of such quality it’s almost hard to put your finger on it. The main cast, now synonymous with these characters to an extent, is just the first example of this particular creative team’s genius and their dedication to quality…particularly in the casting. The ever-loyal Kevin Conroy IS Batman, as far as I’m concerned. For anyone who gripes about the voice of current live action helmer Christian Bale…listen to Conroy in the role. I’m sorry, but NO ONE does Batman like him. Conroy has a gravitas and a resolve that is both mysterious and dark, yet inexplicably heroic. And when I say loyal, I mean it. The dude has logged more hours as the dark knight then anyone…providing the voice of Batman in various outlets from 1992 right up to the “Superman/Batman: Public Enemies” DVD feature this past year. Other standouts of the cast throughout the show include the vengeful tinge of Michael Ansara as Mr. Freeze…the regal nobility of David Warner as Ra’s Al Ghul…the goofball absurdity of Arleen Sorkin as Harley Quinn and the sensual grit of Adrienne Barbeau as Catwoman. Of course, Batman’s most potent foe is also a high point in the form of Luke Skywalker himself. With a manic energy that perfectly balances the kooky clown with the psychotic killer, Mark Hamill’s kinetics as the Joker are absolutely palpable…easily stealing scenes from Kevin left and right. Aside from the main players on the show, there was also a wonderful revolving door of guest stars and cameos throughout the series. The one that probably stands out the best is former “Batman” actor Adam West…conveniently playing a type-cast washed up actor named Simon Trent; known only for his role as TV super hero The Gray Ghost. In “Beware the Gray Ghost,” Trent takes up his iconic role and teams with Batman when one of the plots from the series is made real in Gotham. It’s just such a great nod to West and the legacy he made his own with “Batman” back in ‘66. Every single member of the cast, tailor made for their iconic roles, accomplishes their task of populating and flavoring the world of Gotham City around them. Aside from the Art Design, another of the key elements in the success of “The Animated Series” absolutely HAS to be its excellent approach to and handling of the musical score. Headed by late composer Shirley Walker, the series took a turn from other animated programs by doing the unthinkable and pulling it off. Treating every episode like its own mini-motion picture, nearly every single one of the initial 85 episodes produced for FOX was given its own score…performed live and recorded by a 30-piece orchestra! Since most cartoons resort to stock music cues or overtly garish “cartoonish” muzak, the idea of having each episode’s score preformed by orchestra just gave the series an added richness that is rarely afforded animated programming. Another great component of the series is the fact that it in turn succeeded in giving back to the Batman mythology. Prior to the series, the villain Mr. Freeze was nothing more than a crook with an “Ice” gimmick. 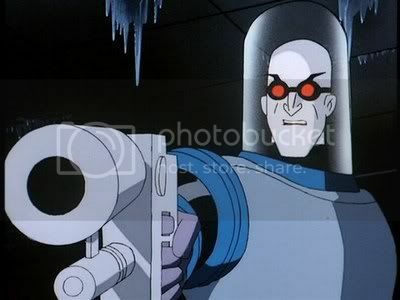 But in the episode “Heart of Ice,” writer Paul Dini crafted an entirely new origin involving Dr. Victor Fries (still pronounced “Freeze”), a brilliant Cryogenics authority who has built a machine to sustain his terminally ill wife Nora, keeping her cryogenically frozen until he could discover a cure. Caught in a lab accident involving the coolants that powered the machine, Fries’ body was horribly mutated…now making it impossible for him to live outside of a sub-zero environment without the aid of his power suit. This origin, created in 1992 for a character from 1959 has since become the official DC Comics origin for the character. Paul Dini won an “Outstanding Writing in an Animated Program” Emmy Award for his “Heart of Ice” screenplay. Dini is also responsible for being the creator of the notoriously likable Harley Quinn. Created merely to be a female cohort for the Joker, Quinn has since come into her own with fans around the world. Since the series, she to has become part of the comic book universe…even getting her own ongoing comic back for a short period at the beginning of the past decade. Gotham Police Officer Renee Montoya, also created specifically for the series, has also gone on to become an important part of the comic books. Of course, for all its drama, “The Animated Series” is not without its playful side…equipped with a wonderful sense of humor when necessary. 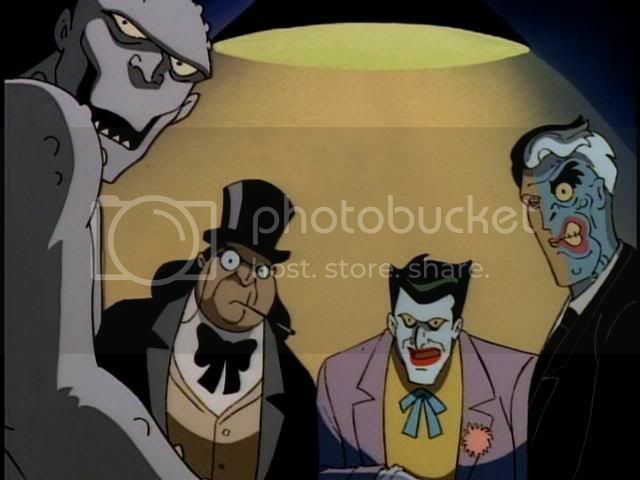 One of funniest episodes HAS to be “Almost Got ‘Im,” in which the Joker, Penguin, Two-Face, Killer Croc and Poison Ivy dish out stories of their own respective run-ins with Batman while playing a game of poker. I mean, where else can you find an action show that decides to center an entire episode around the plot point of bad guys sitting around a table swapping ghost tales of their encounters with the hero? Genius! 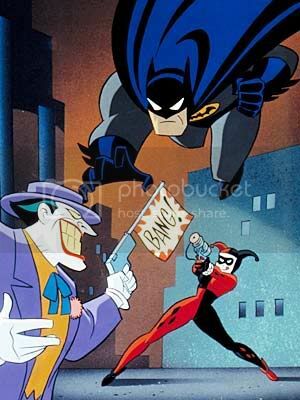 Another resides in the Paul Dini penned episode “Harlequinade,” where Batman teams up with Harley Quinn in order to track down the Joker before he sets off a nuclear bomb in the city. The klutz that Harley is, it’s hilarious to see the chemistry between her and Batman…played very much like the comedy duo of the screwball and the straight man (think Abbott and Costello but with costumes). Of course, thanks to taking nods and inspiration not just from comic books…but from action and science fiction films as well…the series has a tremendous sense of momentum in its action set pieces, performed on the grandest of scales when necessary. “The Demon’s Quest,” a two-part story written by legendary Batman writer/editor Dennis O’Neill, involves the official introduction of Ra’s Al Ghul into the series (after a small cameo at the end of “Off Balance”). Taking its cues from previous Ra’s-related stories, the stakes of the conflict reach far higher than Gotham City…and Batman is forced to travel everywhere from Calcutta and Malaysia to the Sahara Desert in order to prevent Ra’s from igniting global genocide. The episodes have a little touch of just about everything…from “Raiders of the Lost Ark” (admittedly the follow up Ra’s episode “Avatar” is even more “Indiana Jones” inspired) to the James Bond films and are very high octane in their scope of storytelling. It’s all capped off by a beautiful rendition of Ra’s and Batman’s frequent sword duels…very “Robin Hood”-esque (they even got a cylindrical staircase in there just like the old MGM adventure productions!). For all its action and heroics, one of the shows strongest points is that it — unlike other incarnations such as “The Batman” or “Batman: The Brave and the Bold” — actually risked having entire episodes that didn’t feature a single one of Batman’s colorful adversaries. In fact, some of them are down right gritty…full of film noir atmosphere and gangster nuisances. A standout episode early one most likely has to be “POV,” in which a Police Raid gone bad is told in three varied accounts by Officers Bullock, Montoya and Wilkes while they’re being interrogated about the screw-up…as well as Batman’s involvement. There’s also “Baby Doll,” where Batman and Robin confront a former child TV star gone psychotic over the failure of her attempted career as a dramatic actress…or “Appointment in Crime Alley,” which finds Batman making rescues and thwarting a white collar crime to blow the neighborhood off the city map while on his way to an annual pilgrimage back to the spot where his parents were murdered. When all was said and done, at the end of “Batman: the Animated Series” and its run on FOX, the quality of the series and its attention to poignant, adult storytelling had been rewarded with a grand total of eight Emmy Awards. Today, and in some ways even more so than the likes of “Superman: The Movie” or “The Dark Knight,” the show is the prime example of what can be accomplished within the realm of translating comics to film or television…I’d argue quite confidently that it’s the best example of taking a comic book character out of the pages and putting him on a screen. Whether you’re watching the pilot episode or a random episode in the thick of the show’s third season, you can instantly get into it…becoming dazzled by the action and theatrics while also becoming emotionally invested in the characters. 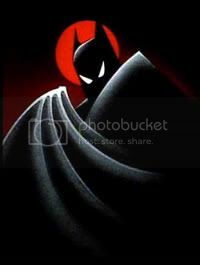 With vibrant music, nightmare noir backdrops and an attention to detail and aesthetic the likes of which animation may never quite see again, “Batman: The Animated Series” will forever remain a pinnacle in the character’s history…and my personal favorite interpretation of Batman in film or television. loved the 90s animated series. its been awhile though since i actually seen many episodes. But Timm did great work with batman here. And we also got two see two robins/knightwing/batgirl, many of batman’s top villains. Good story telling, and wicked great voice work from kevin conory and mark hammill. Reading this brought back a lot of memories.I don’t remember it being genius while watching it the first time around because I was a wee child, but I’m sure if I went back and re-watched i, I’d get it. By this point, I think the show is a wee bit overrated. This animated series was genius!